There comes a point in your life where you have so much going on that you simply can’t get around to playing a two-hour session of Last Night on Earth or Space Hulk, but you still want to game it up. Well, today’s little entrée into gaming glory is a relatively unknown little card game that is great for playing with friends or kids who like ultra-light RPGish games, but don’t want to spend an hour doing it. It’s called The Adventurer Card Game, from Shadowcircle Press, who I had never even known to exist until I started doing my fact-checking for this article. I got this game from a buddy of mine for twenty bucks or so back around last Christmas, and since I haven’t bought games for review of late, I’ve decided to start reviewing games that people may not know about but are pretty neat little designs that people may enjoy. The art isn’t astoundingly good, but is reasonably good and serves its purpose. The first thing I thought when I cracked open the parcel and looked at the cards was that it reminded me quite a bit of the old Don Bluth classic video game, Dragon’s Lair. The nostalgia value alone was worth it, with the campy skeletons, traps, pitfalls, and other dire evils you’ll negotiate during your adventure. It’s a really, really silly, simple game, but for some reason, it’s just fun, especially with kids. I’d almost call it a Munchkin clone, but this is somehow more fun, even without the cutthroat backstabbing aspect that’s missing from this game’s core set. I’m not saying it’s a favorite, but I am saying I’m glad I own it. So, I cracked the box open and was a bit disappointed to find the rules consisted of a single 8.5×11 sheet of paper with text alone. Also inside were two dice which would determine the fate of nearly every riposte and parry, and a scant 85 cards. That’s the whole shebang. Luckily, this game retails for a mere $19.99 USD, so it’s really not a bad deal if the game is good. I’ll get to that in a minute. As I noted, this is a light RPG, and by light, I mean helium light. It’s certainly not the Simple Jack of gaming, but it’s not Warhammer Quest, either. The main concept of the game is that the players play as one of four character classes that, while almost exactly the same regarding abilities, have unique enough art so that the girls can play the girly characters and the lads can play the manly ones. The purpose of this little romp is to adventure through a dilapidated mansion loaded with all manner of peril to hunt, and ideally impale with a stake, the dreaded Count Lodrac, vampire of stature, and dyslexia sufferer. The gameplay is almost precisely like Munchkin in that it consists of “take a card, resolve a card,” but there’s no treasure deck. Each player, on their turn, will take a single card from the deck and set it before them for all to see. Most cards are encounters with terrible monsters, but some are traps, obstacles, and other dangerous plights. Each card must be resolved by passing a skill check, which amounts to rolling a die or two, and the result is generally limited to keeping the defeated card as a treasure item, being able to pass onto the next room, or being hurt. Some cards are even free, unguarded treasures, with most treasures being weapons or armor. In all, there’s some variety, but not a tremendous amount. Let’s explore, together, what these epic horrors entail. In the case of enemy cards, they will tell you what room you’ve just entered, have an illustration of the vile fiend you’re there to smite mightily, the fiend’s name, and what its attack bonus is. At the bottom of the card there may be a treasure indicated, and this card is kept by the player after a victorious slaughtering of the fell beast as both a trophy and a treasure. Many times the treasure is a weapon, which will bolster your attack bonus for further tussles down the road. Trap cards simply have an illustration, a description of what the trap you’re encountering is, and the bottom section of the card describes what it is you need to do to avoid becoming yet another of the foul Count’s permanent decorations. Each of these also has a reward, generally, but these are more suited to exploration than beheading, with most being keys or potions. Obstacle cards, such as doors and fallen rocks, may only be passed by either using an item or character power to unlock or unblock them, or you simply lose your turn while searching for an alternate path. These cards have no reward other than the ability to take another card if you can remove the obstacle. Each character has a special power, as noted, and all of them relate to the obstacles. For instance, the wizardy bloke uses his eldritch, weird powers to unlock doors sealed by magic. The He-Man guy, well, he can move boulders out of the way. It goes on like that, with all the characters being able to defeat one type of obstacle without penalty. Unguarded treasures are niceties that allow you to simply walk into a room, pick something up, and then walk onward. No check, no test, no hidden surprises. Consider these to be like finding that penny in the K-Mart parking lot, only these generally turn out to be a hell of a lot more valuable. These items can be single-use potions, multiple-use items that benefit you somehow, or decent weapons. Now that you’re familiar with the cards of Adventurer, well, let’s get to the good stuff, combat. I know you were expecting some rousing commentary about the swashbuckling, parrying, dodging and slicing of carotid arteries, but no luck. Combat is simple: roll one die for yourself, one die for the baddie of record, and then add your respective combat bonuses to determine the attack values of both parties. The high value wins, with all monsters being murdered mercilessly on a single hit and the player taking one damage point on a loss. To further insult the monsters, ties count as hits on the monster. If the monster is too tough to handle, you can also run which is resolved by a die roll with 50/50 odds of escaping. Armor cards can be used after a failed attack, and this mechanic simply allows you to roll the dice again, with a victorious roll not killing the monster, but instead merely allowing you to not take damage. These items are fairly rare, all things considered, so they do actually offer a good amount of value to the player who owns them. Regarding damage, the character cards have their edges numbered one through four, and when a player is hit they rotate their card to the next lowest number. Once a character loses all their life points, the player loses half their items and can start again, which is really not all that bad of a deal for the player, seeing as the beheaded monsters end up being carried by the player, generally, to warn other monsters that you’re just not in the mood to be fucked with. Well, that’s how I envision it, anyhow. 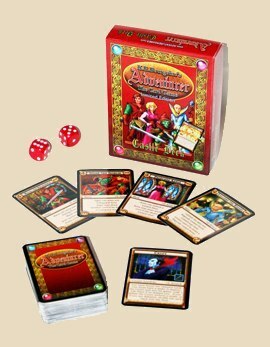 I guess this is another reason that Adventurer is better than Munchkin; these guys actually included counters! Traps, as mentioned, are fairly straight forward, but you need to roll two dice instead of one. Some items give you bonuses to this roll, but they are few and far between. A loss generally results in losing a hit point, but I always thought being sliced up by razor-sharp wheels of death or falling in a vat of muriatic acid would be a little more gruesome and may result, at a minimum, of needing urgent medical care. The only reward for beating traps is not being killed, really, although some traps do have really good treasures like +4 bows or stakes. Count Dyslexia may show up at any time as he’s randomly inserted into the deck so making sure you get, and keep, a stake in your inventory is crucial. The funny thing is that you don’t actually need to “use” the stake in battle to kill the count, just having it on hand is enough. I suppose once you’ve pulled a Holy Grail move and severed his arms and legs, he’s not really squirming enough to resist you dropping a stake through his heart while doing a Don LaFontaine impersonation, screaming “Fatality!” If you don’t have one, you simply lose the battle and reshuffle the old vampire back into the deck to be encountered later. If, by some chance, you happen to defeat him, he’s dead and the game is over. The winner may do a victory lap around the table while slapping his opponents in the back of the head, or you just put it away and go get a cold drink. Your call. There have also been two expansions released, Portals, and Chaos, which add a bit to the game. Portals adds player interaction in that it allows trades, theft from one another, and assaults upon your companions. Further, an interesting magic-like system comes into play, and some really nasty traps come into the fold. It’s certainly the better of the two, in my opinion. The second expansion, Chaos, adds some evasion cards which allow you to decide to enter a room or not, but the real draw for this expansion is the Chests of Power mechanic. Instead of simply snuffing the King Vamp, you need only collect three of these treasures to be declared the winner. Chaos came out after Portals, and without Portals being in play along with Chaos, this mechanic is pretty useless. It’s hard enough getting three chests, but not being able to steal from your opponents makes this a truly difficult task unless only two players are involved. I find it ironic that it’s a game about a vampire, and that you have to count one…two…three treasure chests to beat the Count. Somehow I think this may be a Sesame Street reference, but I can’t be sure. Finally, there are some expansion heroes, one of which was designed by none other than the late gaming icon, Gary Gygax. It must be a decent game to have Gary mess with it, and this is another of the main reasons I’ve decided to review this game. I’ve played it around twenty times, with and without the expansions, and all things being equal I’d have to say that for as simple as it is, it’s quick enough to get through it without getting bored, and it’s fun enough to play with your kids rather than another round of Hungry, Hungry Hippos. Like I said at the beginning, this game is very, very light, has some RPG elements, and is very acceptable for playing with kids that aren’t frightened easily. The art is very campy and cartoonish, but that being said, I certainly wouldn’t play it with a seven year old little girl. I waited until mine was seven and a half. Hey, this is a game that’s fun to play with your kids, or maybe even with the friends you usually play Munchkin or Lost Cities with. It’s not ever going to be considered groundbreaking or even memorable except by those who’ve played it, and that’s only because there are some fun moments in the game that add up to a reasonably good time. Thanks for the review! Just a heads up though, all dice rolls use 2 dice. There is never a roll in Adventurer that uses only 1 dice. Wow! That’s the first time a designer has come in and commented! Welcome! Yes, you’re absolutely correct. I’m looking in my box right now, and there’s 4 dice; 2 red, 2 white. Don’t know why I wrote one die in there. Thanks for making such a fun little game, K.R. It is still one of my daughter’s favorites and we still play it fairly often. You’ve given us quite a few memorable moments together, and I am truly in your debt for that. No, I’m in your debt for giving the game a try. Thank you! A lot of people have found Adventurer a great intro game for their children, I’m glad its also entertaining for you and your daughter. One father told me he carries the cards and dice around in a ziplock bag and he pulls it out of his jacket pocket to play a quick game with his boys whenever they are out and have to wait for his wife or something. It is a very rules light game on purpose, and that is just because I have a terrible memory and cant remember tons of rules. I promise, its true! That being said this card game is the first in a line of games that I made, each one of them progressively more involved in both depth and scope but always building of this core rule system. Where can someone interested find out more information about other games you’ve created? I think there’s a lot to love about this game, and if you’ve carried on with the same mentality of keeping it simple, but not too simple, then they’re sure to be hits. I’m always open to reviewing games from small-press publishers; The Circus has a soft spot for independent game publishers and designers, and we do interviews and reviews for such companies as Plaid Hat Games, Small Box Games, and other companies that don’t get a lot of love in the “mainstream game press”, so to speak.